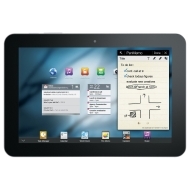 alaTest has collected and analyzed 905 reviews of Samsung GALAXY Tab 8.9 (P7300, P7310, P7320, i957). The average rating for this product is 4.3/5, compared to an average rating of 4.3/5 for other products in the same category for all reviews. Reviewers are impressed by the performance and screen. The portability and usability also get good feedback. Many are critical about the GPS navigation and touch screen. Just like computers and mobile phones, tablets are not a one-size-fits-all technology. Sure, Apple is selling plenty of iPads , but many people are looking for something a little more compact. The Samsung Galaxy Tab 8.9 packs the full Android Honeycomb tablet experience ( soon upgradeable to Android 4.0 ), along with Samsung's useful customizations, into a compact body. The lack of ports on the tablet will be a problem for some and the plastic back leaves the Tab 8.9 feeling less solid than the iPad 2. The Samsung Galaxy Tab 8.9 is everything we loved about the Tab 10.1 in a slightly smaller form, with a slightly smaller price. This complete review of the Galaxy Tab 8.9 goes over strengths, weaknesses and compares it with the Tab 10.1 inches and other tablets.